Discover the city of Romeo and Juliet with many discounts and benefits! 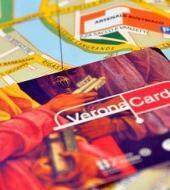 The VeronaCard is an all-inclusive city-pass that brings you to all of Verona's main museums, monuments and churches together with free transportation by bus! Please note: The VeronaCard is personal and can not be transferred. Children under the age of 8 have free access to the monuments and children under the age of 12 have free entry to the churches. Monday 1: 30pm - 7: 30pm. Tue - Sun 8: 30am - 7: 30pm. Closed at Christmas, New Year and Easter Sunday.